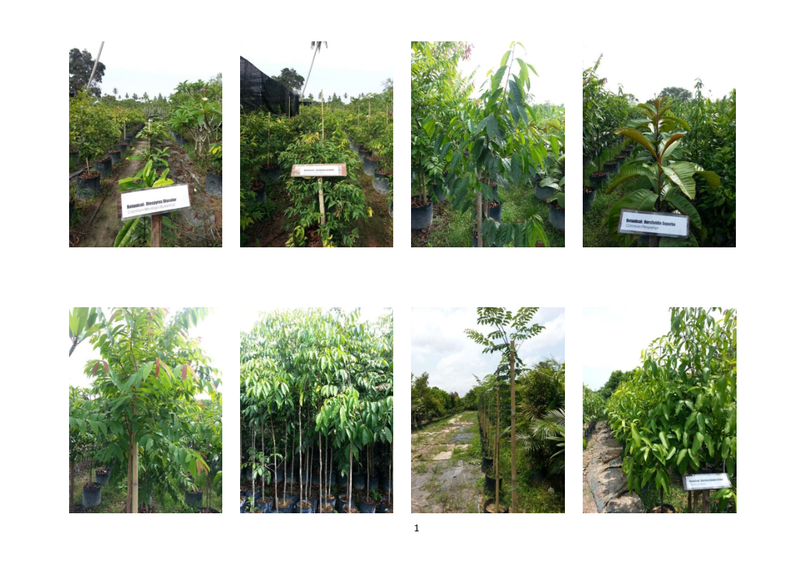 « Kelajuan green tak konsisten. No one can deny problems of mowing during the current rainy spell. Its not about worrying about the machine being in the rain or operators catching cold, it is more about tyre marks and tracks left behind by the machine. Deja vu? You've seen this before? Pretty common sight nowadays. The tracks can churn up the soil and cause more damage than just un cut grass. However, there are times when out of habit or necessity, the Superintendent has to have a crew out to cut the grass. After all, the rains may have caused the slow-release fertilizer in the ground to suddenly release all nutrients; causing rapid surge growth of the grass. Then there is also the issue of greens, how do you not cut the greens? Especially if the rains has been pouring almost daily? What are the options open for the Superintendent or the caretaker (some of the concepts apply to parks/stadiums too)? The Superintendent may try to use a lighter machine, like a triplex on fairways/roughs and walk-behinds or push-mowers on greens or tees. This is one reason I have always specified 4-wheel drive or all-wheel drive machines for fairways, roughs, fields and parks; less slippage for mowing on wet ground. Those people that are stuck with 2-wheel drive machines are … well… stuck. 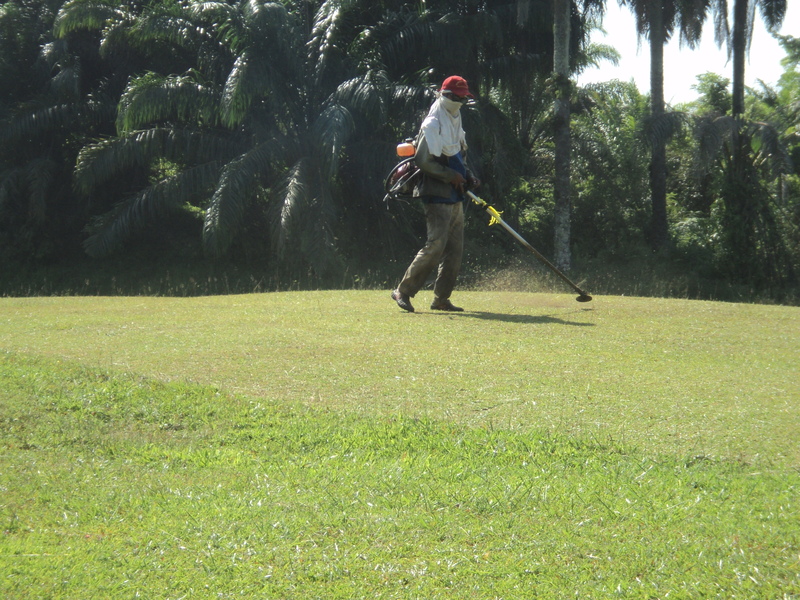 Use bruchcutters – the machines that the crew carry on their backs to mow. Concentrate on mowing only important places like landing zones, greens, blue & red tees when there is a break in the weather pattern. before the start of the rainy season, in fact, I use this all year round on fairways, bunker face, slopes, and greens. So when there is prolonged wet weather, the growth of the turf is slow enough that I’m not under too much pressure to mow. Spraying during wet season is tough, it needs 4 hours of dry weather to become rain-fast. Be warned there is a slight discoloration the first time you apply because the stem is visible under the shorter leaves: stem brown, leaves green. 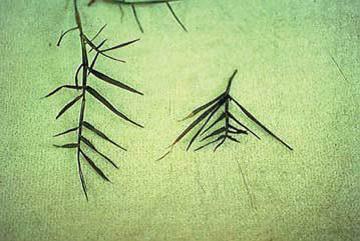 The stem will become shorter, later than the leaves. Then it will be back to normal color. I also advocate marking the worst areas and prioritizing them so that come dry weather (I know some days we despair of ever seeing that!) we know the locations where we want to put extra or repair existing sub-soil drains; reshape the area surrounding it; put an extra layer of topdressing; bring out the deep-tine machines or at the very least spiker/slicer; dethatch or scarify the areas since thatch and mat can become like sponges soaking up water; call a bomoh/medicine man or whatever can be done to alleviate the soggy areas. 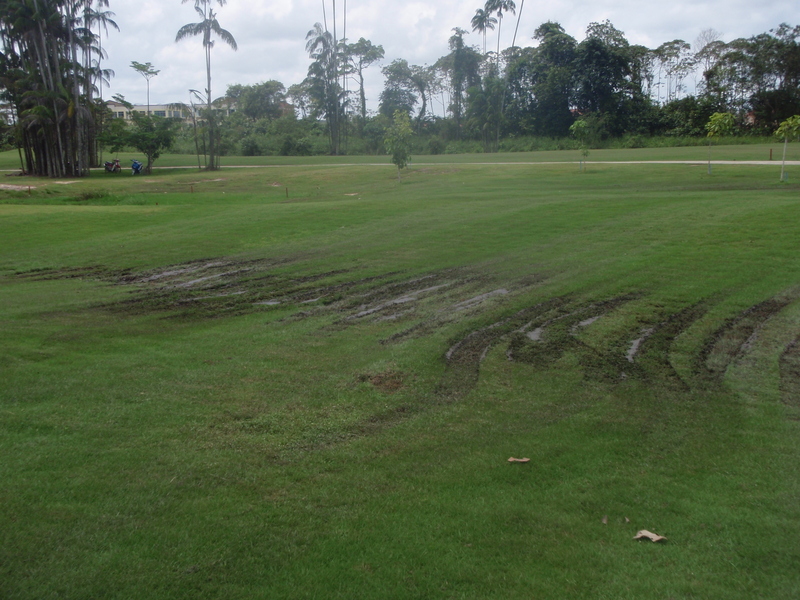 I pity the members of the club/field/park that face the same problems in the same areas over and over again. You would think the management would have done something to ensure it does not occur again next season. Oh well… maybe there are other issues that need to be considered: funds for one. I can’t argue with that. This entry was posted on March 22, 2011 at 7:33 am	and is filed under Padang, Padang Golf, Taman. You can follow any responses to this entry through the RSS 2.0 feed. You can leave a response, or trackback from your own site. Hmmm, I honestly do not think any management would intentionally leave the problem area unattended or ignored. May be they have not found the right solution yet. No? You could be right. However, from experience, I can tell you that almost every end of year when the rainy season starts I will get calls for help from committee, management or caretakers or contractors for golf courses, football fields and – one time – public park for disease or water-logged problems. I’ll go there, discuss, recommend stuff and come back and write a consultancy proposal. Inevitably, because they have implemented my initial suggestions or because by the time they have presented my proposal to senior management or higher committee the rains have stopped and there is no more urgency; my proposals get KIVed. Guess what? Next rainy season I get the call again. Also, I have been in cases where the solution was staring at everyone in the face and all I had to do was point it out. Most will agree, some implement and some don’t implement it and the case continues. Somebody in commitee or management will call me later and voice out their frustration. So I guess I’ll stick to my own opinion. P.S. for the record, the public park DID implement my suggestion and their problem was solved. And no, it wasn’t cheap to implement it.